VALUE IS WHAT YOU GET"
True ownership of one share of Berkshire Hathaway stock framed like you want. The recipient becomes a real shareholder of the company. Now you too can own a share of Buffett's prized company, Berkshire Hathaway, Inc. 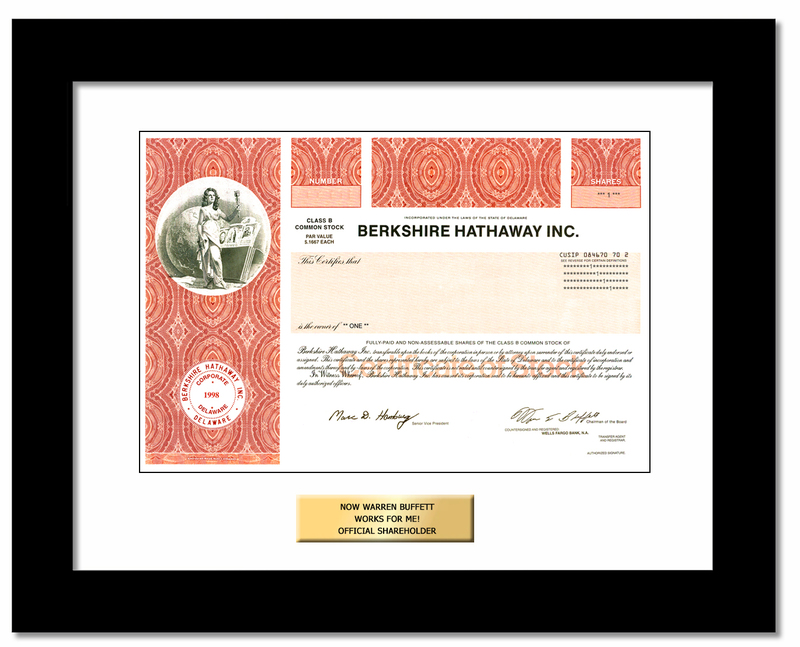 The Berkshire Hathaway stock certificate is strikingly ornate and old school. It represents a snapshot of history incorporating the company's name, logo, corporate seal, and printed signatures of corporate officers. Get yours while you can because in the not too distant future, the industry will eliminate physical stock certificates making these valuable collectibles. Berkshire Hathaway, Inc. is run by world-renowned investor and billionaire Warren Buffett. It employs a value investing approach, investing across sectors. The Class B common shares, dubbed "Baby Berkshire," were first issued on May 8, 1996 to meet demand from investors who wanted to share in Buffett's legendary investment expertise, but couldn't afford Berkshire Hathaway's original stock.